You can tell the child of the 1970’s by his references to TV growing up. A program called Name that Tune pitted two contestants against each other in a reverse bid. Each would count down the number of notes they promised that they could hear before guessing the song. Usually seven notes were at the bottom of the bidding war. However mighty memory with trained ear could pick it up in four. That’s where my attention turns to when the fourth forkful went down. In the up and coming Northern side of Seattle’s downtown sits a fish restaurant that turns heads. Chef owner Christine Keff plays her music nightly to hungry and adventurous guests. The spot is called Flying Fish and has been a staple of the Seattle food scene for 18 years. She pulls back the bow of her violin to let flavors cry out from the sea. It was on some random Thursday when Willie and I sat for lunch. 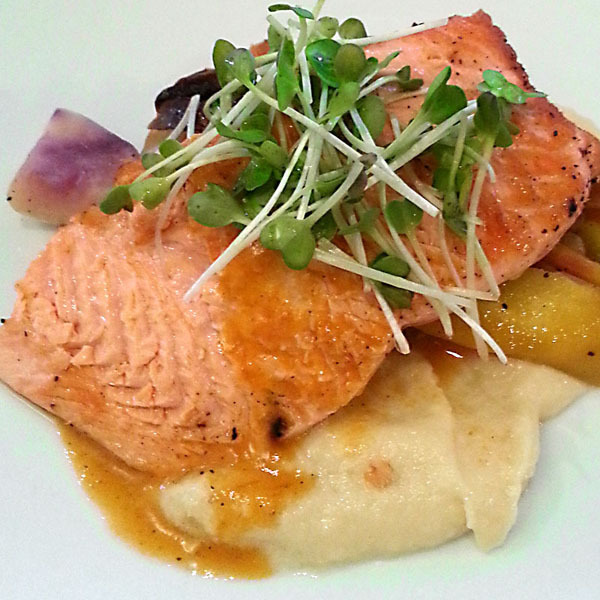 The Steelhead entree catches my ear. When the plate descends from what seemed to be heaven, the perfume and color of the fish triggers memories of salmon. No doubt due to similar characteristics of the more famous, royal cousin. Planking layered the fish with an added quality of smoke. While the fish stands on it’s own, the vegetable puree adds a woodsy dimension. In the chorus sings the parsnip with a siren’s song of apple-scented notes. The whole experience is like a dance between trees and the river. And then it hit me. Chef Christine was playing song from Texas. I had heard it before. It is barbecue. Not the over-the-top meltdown of huge slabs of meat rubbed down with spices, slow-cooked over mesquite and slathered with a tomato-based sauce. That’s a Richard Wagner opera. No. She was whistling the tune, but in quieter, fish form. The stout fish carries a round feel from the natural oils. Not quite the greasy rib, and yet not unlike it. It picks up a smoke flavor because it roasted on planked cedar. The mash of roast veggies smacks of apple, slightly cider-ed. A familiar sweet-sour effect mirrors the play between molasses and tomato in Texas BBQ sauces. Yes the melody is the same. The instruments are different. The melody is universal. Take bacon that accidentally dips into maple syrup. Or the pairing of Sauerbraten with red cabbage stewed into with apples. Or Duck a l’Orange. We embrace these dishes precisely for the hidden melody. The perfect combination of smokey, heady, slightly sweet and a twang of ascorbic acid. So the next time you sink into a dish that is so good that your toes uncontrollably curl, stop and think. Use your tongue to listen for the melody. Where in your past have you experienced this before? When the answer is clear, add your experiences to comments section. We all want to hear what songs play from your plate. And how many notes did it take you to get there. I’m guessing four.